Mix cake mix, oil, and egg until incorporated. Roll cake mix into walnut-sized balls and place on a parchment-lined cookie sheet. Bake for 8-9 minutes. Do not overbake. 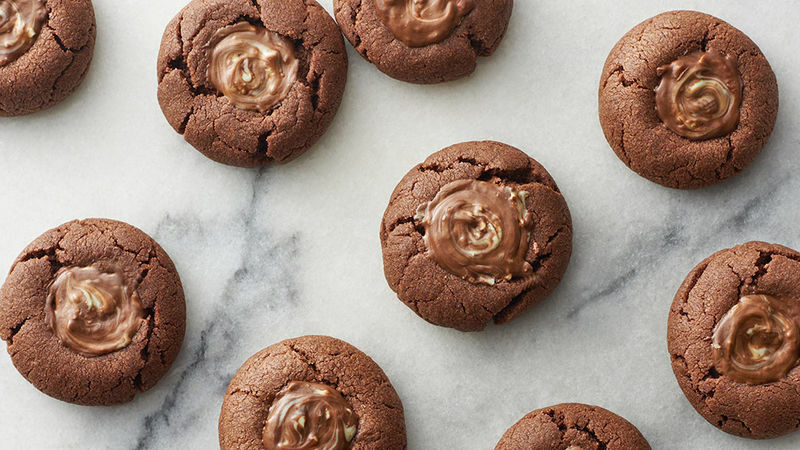 When the cookies are out of the oven, slightly press half of an Andes™ mint on top of each cookie. If using Andes™ mint baking chips, make a small dent with a spoon and place about a teaspoon of chips into the dent. Either let the mint sit for about a minute or place the cookies back in the oven for about 10 seconds to melt the mint. Use the back of a spoon to gently swirl the melted mint. My favorite part about eating at Olive Garden® is when the waiter leaves the check along with some Andes® mints at the end of the meal. Sometimes, if the waiter is in a good mood, you might get lucky and get a couple of extra mints. Tell me I’m not the only one who searches for the basket of Andes mints on my way out of the restaurant hoping to score an extra handful of mints! Don’t lie… That’s not my only encounter with Andes mints. On a drive up to a cabin for the weekend I may or may not have downed a whole box by myself without even blinking. I just sat there unconsciously unwrapping and popping each mint into my mouth. I have to warn you they are very addicting. So I knew with my previous history, that I might not be able to stop shoving these Andes Mint Cookies in my mouth once I made them. I hate being right. The combination of chocolate and peppermint gets me every time. These are made easy by using a boxed Devil’s food cake mix and make plenty to give to your friends and family. Doesn’t this picture make your mouth water?